Best Choice Products is proud to present this brand new Raised Garden Bed. 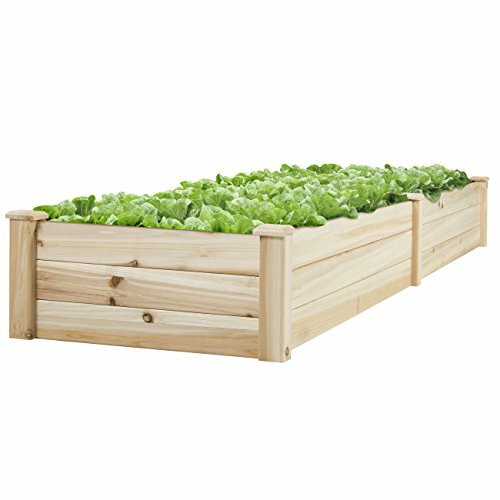 This 8’ by 2’ garden bed is perfect for growing your plants and vegetables. The wide and long bed will give your plants ample space between each other to grow efficiently. The boards are made of 0.5 inch thick Cedar wood that is built to last through the seasons. The bed also comes with a divider in the middle so you can separate it into 2 garden bed boxes. This will allow you to grow w separate types of plants in the same box. The quick assembly, and no tools required, gives you everything necessary to build your new garden bed right out of the box. Use this bed on your patio, lawn, or garden. Fill it up with soil (not included) and start planting your garden this season. We purchase our products directly from the manufacturer, so you know you're getting the best prices available.